The Pacific War Online Encyclopedia: Barrett, Charles D.
Barrett was one of three Marine majors (the others being Lyle Miller and Pedro Del Valle) who began drafting the Tentative Manual for Landing Operations in 1931. This document laid the foundation for Marine amphibious operations during the Pacific War. 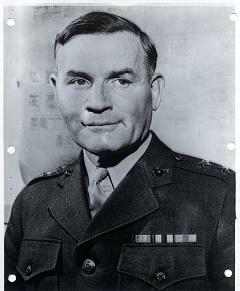 Barrett commanded 3 Marine Division from its activation on 16 September 1942 to September 1943, but never led the division in combat. He commanded I Marine Amphibious Corps from 15 September 1943, but died on 8 October 1943 while training his troops on New Caledonia under circumstances strongly suggesting suicide: He fell from an upper window to his death, the window sill was four feet off the floor, and a chair was found by the window. Halsey had apparently told Barrett that he intended to relieve him of his command the previous day. However, the inquest ruled the death an accident, likely because of the strong Western stigma against suicide. Barrett had a keen intellect and broad experience in the Corps, but he also had a tendency to "step out of character and endeavor to run . . . whatever higher echelon to which he was assigned" (Rems 2008) and a "humanitarian" character that made him so averse to casualties that he had difficulty accepting the necessary risks of war. Commissioned in the Marine Corps and assigned to Marine Officers' School.